You are eligible to upgrade your account to enable the Hot Lead Alerts add-on. The cost of the add-on is $5/month per User in your turboDial account. What is Hot Lead Alerts? 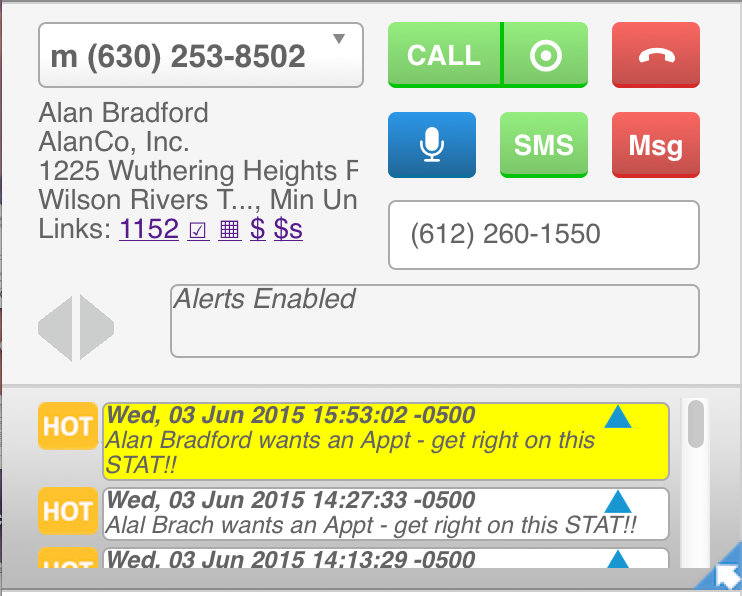 Hot Lead Alert in turboDial on your PC – when any Contact achieves a selected Goal in an Infusionsoft campaign an alert notification and a chime will be displayed on the turboDial panel of every User in your account, or for a chosen group of Users. Hot Lead Alert Notification on your Mobile Device – if you have the turboDial Mobile (native) app installed on your mobile device you can also receive an immediate notification on your device when the Hot Lead Alert event occurs. See more details for that feature on this page. You can create a Hot Lead Alert any place in an Infusionsoft campaign. And when an Alert is triggered the specified turboDial Users will receive an audible alert and visual notification right in their turboDial panel. Clicking the blue up-arrow in the Alert will move turboDial to re-focus on the Contact associated with the Alert. Then you can call them, send an SMS text message, or open their contact record – you can quickly take the right action appropriate for the type of Alert received. 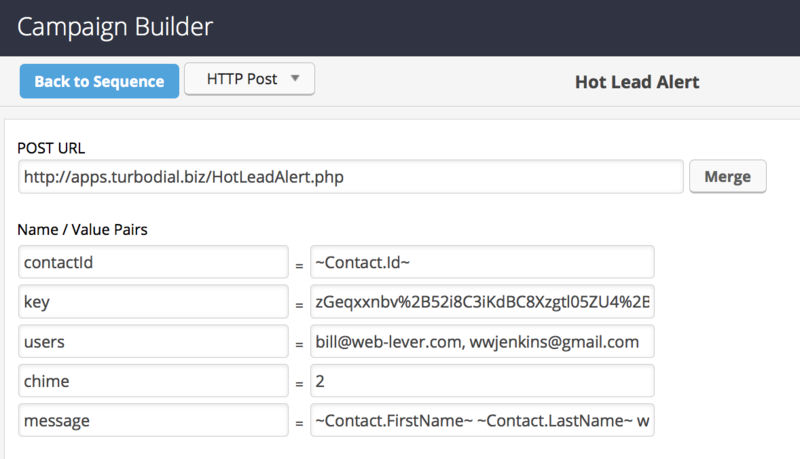 Each Hot Lead Alert you create can be set to notify a single User in your account, or a list of Users, or all Users. Optional: A Hot Lead Alert can be configured as “claimable”. With a claimable Alert, the first User who clicks the blue up-arrow in the Alert will “claim” the Alert, and the Alert will be deleted from the turboDial Panels of other Users in your account. Your Hot Lead Alerts are initiated with an HTTP POST process in an Infusionsoft campaign. There is no limit on the number of different Hot Lead Alert types you can configure – and install a unique HTTP POST for each. The method to initiate a Hot Lead Alert from your Infusionsoft campaign is to use the HTTP POST process in a Campaign Builder Sequence. message ~Contact.FirstName~ ~Contact.LastName~ wants an Appt – get back to them ASAP! Always use copy-paste for the POST URL and all Names in the left column. Note that every Name is in lower case, except for contactId which has a capital ‘I’. The key is the encrypted string turboDial assigns to you. Your turboDial account owner should be saving a copy of the key, and they can also retrieve it by entering their turboDial account email address into the form on the right side of this page. The users is where you specify which of your turboDial users should receive this alert. You can enter ‘all’ if you want all logged-in users to receive the alert. Or, provide one or more Infusionsoft ID email addresses in a comma-separated list. The chime is a value between 1 and 3 that specifies the sound to be played on your user’s PC when the alert arrives. See the list of options below. The message value is the announcement for your Hot Lead Alert. This message will be on the turboDial panel for each user. It can be up to 1000 characters long but should be kept much shorter. You can use merge fields in the message, as shown in the partial example above. The claim name/value pair is optional. If you include it you may set it to ‘yes’ or ‘no’. If claim is set to ‘yes’ then this Hot Lead Alert may be “claimed” by the first User who clicks the blue up-arrow “assign button” in the Alert on the turboDial panel. When a User successfully claims a Hot Lead Alert the same Alert will be deleted from the turboDial panels of other Users in your account. Download the slides from the video.